There are surprisingly few apartment buildings on Park Avenue that occupy an entire blockfront. Those at 655 and 1185 do as does this Italian-Renaissance-palazzo-style building that was erected as a cooperative in 1923. Interestingly, these three buildings are very different from one another: 655 has a large garden and a major setback; 1185 is one of the citys few great remaining buildings with a very large central courtyard; and this building is a narrow slab. This is one of the more attractive designs by J. E. R. Carpenter, the leading architect of luxury apartment buildings in the city of his generation. 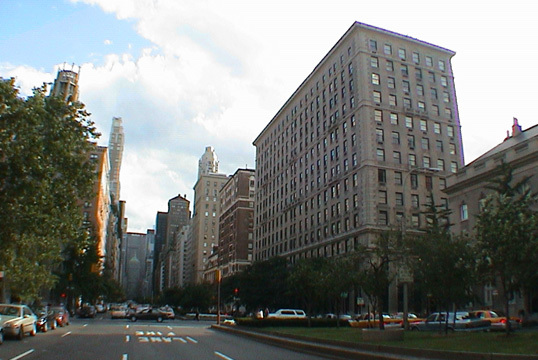 His other Park Avenue buildings include 550, 625, 630, 635, 640, 655, 812, 950, 960 and 1050. His Fifth Avenue buildings include 810, 825, 907, 920, 950, 988, 1030, 1035, 1060, 1115, 1120, 1143, 1150, 1165 and 1170 as well as 2 East 66th Street. This very elegant and imposing apartment building was erected as a cooperative in 1923 with 52 apartments and it now has 60 apartments. The 14-story building has a four-story, limestone base with a large entrance and lobby in the middle of the avenue frontage flanked by professional offices. The lobby has a marble floor, coffered ceiling and a few steps lead up to a balustraded hall. It has a canopied entrance with a doorman and sidewalk landscaping, but no garage, no sundeck and no health club. The building's quoins are limestone. According to James Trager, the author of "Park Avenue, Street of Dreams," (Atheneum, 1990), "each apartment had a separate laundry-and-storage room in the basement, and there were thirty extra servants rooms in the penthouse." This section of Park Avenue is very desirable because it has several very handsome low-rise buildings and churches that make it architecturally quite interesting and also provides more open views. It is also very close to midtown and convenient to many fashionable boutiques and restaurants along Madison Avenue and is not too far from Central Park.